During product development on Toradex Computer modules, in case there is a need for confirguration of some special audio codec features, especially those which are not accessible through the common wave API, the AC97 Tweak referenced here will come in handy. This tool is available in the Toradex Colibri Software. Please keep note that the Audio Driver mutes the Audio-Out path after each played sound. 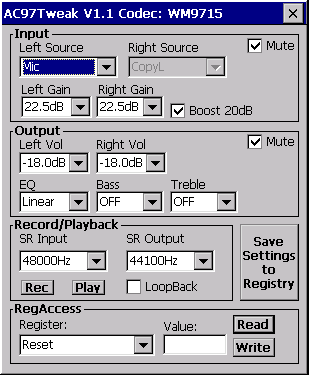 The AC97 Tweak tool does not reflect this correctly in the Mute checkbox.